Buy Leanna - frenchpressplz a coffee. ko-fi.com/frenchpressplz - Ko-fi ❤️ Where creators get paid by fans, with a 'Buy Me a Coffee' button. 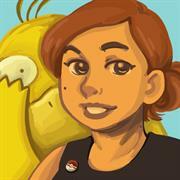 Leanna C. is a comic artist and illustrator with a penchant for sharing opportunities and encouraging creators. Hello, and thank you so much for your support! I'm Leanna, and I love to spend my time, focus, and energy on creating art and sharing resources with others. My current goal is to raise funds to maintain hosting for Paper Cat Press (papercatpress.com), where I share opportunities for creators on a weekly basis, conduct creator interviews, and provide other resources. Tips of any amount through Ko-Fi are a helpful way to say "thank you" and show support! If you have suggestions and thoughts on future goals or projects, just let me know. Thank you very much! Secured Payments. Support goes to Leanna - frenchpressplz's account. Upgrade Leanna - frenchpressplz to a yearly Gold Membership with a one-time payment.